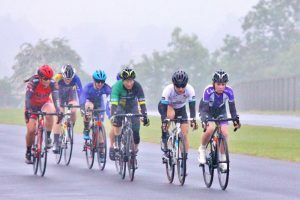 After so many weeks of pleasant weather at Odd Down, round four of the women’s series faced torrential rain and a cold, murky evening of racing. With the race restarted following an early crash after a rider snapped her chain attacking out of the group, the bunch was not together for long as the strongest riders drove the pace. The wet corners and spray turned it into a test of grit and nerves as the battle for the overall took shape. Lauren Johnston (Avid Sport) and Charlotte Berry (VeloVitesse) were looking to take advantage of the absence of series leader Lucy Driver (Forever Pedalling) and third overall Molly Hodges (Avid Sport) to establish their overall position. And it was this pair that set about shrinking the group with only Aimee Parsons (Avid Sport), Elizabeth Pressage University of Bath) and young Laura Curle (Liv Halo CC) able to make the selection. Berry was still not content though, and with three laps to go she attacked with Johnston on her wheel. With an Avid Sport teammate in the chasing group, it was clear that the pair wouldn’t be caught and Johnston was able to come off Berry’s wheel in a repeat of the round one result to take the win. Berry’s second place sees her move up into first place overall on the series standings and Aimee Parson’s best result of the series in third sees her move up into fifth place overall as she took the sprint from group two. Laura Wells (Mickey Cranks CC) has been frustrated in rounds two and three, finishing second behind Avid Sport’s Fran Bromley. But with her rival out with illness, Wells was able to seize her opportunity to claim her first win at Odd Down. Wells had shown her sprinting legs in both the previous weeks, and despite the bad weather was happy to trust her turn of speed to take the win this time around. Olivia Hall (Performance Cycles) was her closest challenger in second with Joanna Goodhead (Avid Sport) taking her second podium in two weeks ahead of Sally Crocker (Salt and Sham CC). Berry now takes the overall series lead with 165 points, fifteen ahead of Johnston who moves from fourth to second. Despite not racing this week, Lucy Driver still sits in third place overall.